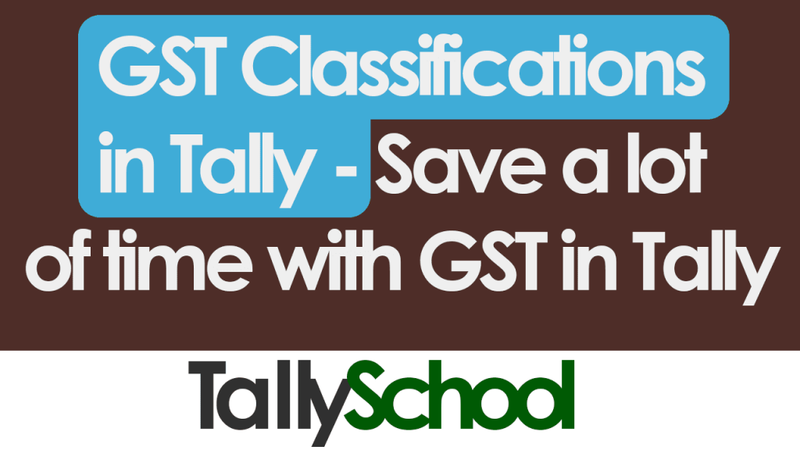 Do you know that you can save a lot of time with GST classifications in Tally? Since the GST became applicable in India, Tally ERP 9 has been updated accordingly and a lot of new features are added which can actually save your time. So, let’s quickly jump in. GST Classification is a way of recording all the GST details such as GST rate, HSN, SAC and other details relating to a product or service in such a way that it can be used in future with one click of a button. It is like making a package and then applying it accordingly whenever and wherever required. For example, you have 3 products which are table, chair and sofa. They all fall under a category called Furniture. Now, GST details for the entire Furniture category are exactly the same. With the help of GST Classification in Tally, you can set a classification and apply it to the category directly. In this way, you do not have to enter the GST tax rate details in each of the stock items in Tally individually. This is how a GST Classification looks like which we are going to use in this post. Also, while creating new stock items in Tally, you can just select GST Classification and every GST detail will be automatically captured and applied to the stock item. GST classification also works with ledgers in Tally which are used for providing services which attracts GST. This is why GST Classification in Tally will save you a lot of time as you can directly apply it instead of entering all the GST details again and again. Now, let me show you how to create a GST Classification in Tally. Creating a GST Classification in Tally is as simple as creating an accounting voucher in Tally. Before you can create GST Classification in Tally, you need to enable it. Here is how you can enable GST Classification in Tally. From Gateway of Tally, go to Features by pressing F11 which is the shortcut in Tally. Then go to Statutory & Taxation. 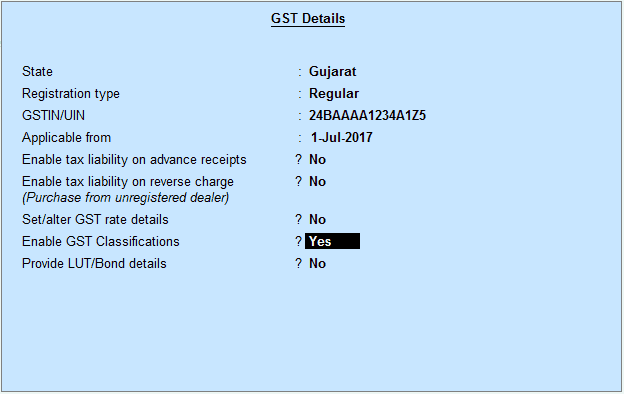 Type Yes against Set/Alter GST details option. You will see a GST Details menu. 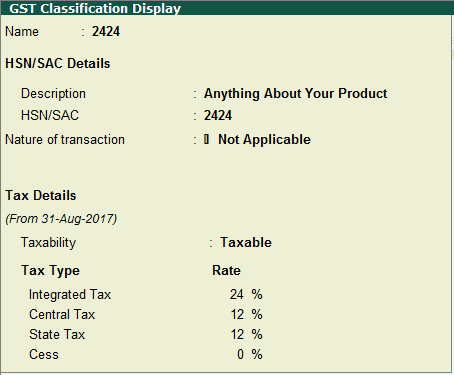 In the GST Details menu, you will see the last second option called Enable GST Classifications. Type Yes against it and press Enter. Press Enter and save it when Tally asks to Accept it. You will be back in the Statutory & Taxation screen. Press CTRL+A to save the details which you just entered. Now, we will move on to create a GST Classifications in Tally. For that, come back to the Gateway of Tally once again. We will be creating 2 different GST Classifications in Tally. One for goods and other for services. They will both be based on HSN and SAC respectively. Here is a step by step procedure to create a GST Classification in Tally. From Gateway of Tally, go to Accounts Info. which is literally the first option in Gateway of Tally. In Accounts Info., select Statutory Info. In Statutory Info., select GST Classifications and in there, select Create. Now, you will see a GST Classification Creation screen. We will name the GST Classification according to HSN first. I’ll name it 2424 just for explanation purposes. You can enter your real HSN or SAC. Now, enter the Description of your choice because it doesn’t matter what you enter in the description. In Nature of Transaction, select Not Applicable. If we select a Nature of Transaction, this classification will be limited to that kind of transactions only. So, in order to use it anywhere, we select Not Applicable in Nature of Transaction. We will enter the rate 28% in Integrated Tax which means 14% each in Central and State Taxes. Enter the cess if necessary. I have left it to zero. Press Enter and Accept it. Now, in the exact the same way, I will create another GST Classification for Services. Let’s take the SAC as 3535 for this explanation and GST rate to be 20% i.e. 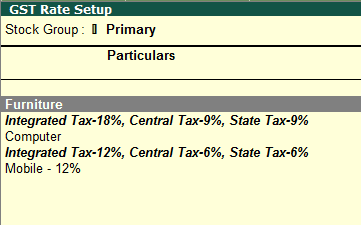 10% each for Central and State Taxes. 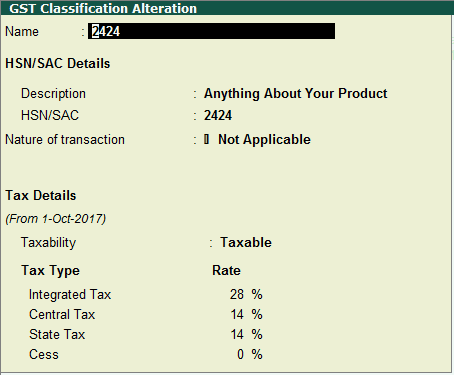 I am assuming you have also created another GST Classification called 3535 with SAC 3535. We have created all the GST Rate Classifications and now I will show you how you can use it in Tally and save a ton of time. There are many different ways in which you can use GST Classifications in Tally. I will show you the most easy way for goods as well as services. Goods in Tally means Stock Items in Tally. As per the example of the Furniture which we discussed above, I have created 3 Stock Items called table, chair and sofa. Table, chair and sofa – All in One! Go through my another post in which you can learn step by step using stock items in Tally under a group if you don’t know how to do it. If you are creating new Stock Items, please don’t enter any GST Details because we are going to enter it by the use of GST Classifications in Tally. If you have previously created Stock Items but not configured for GST, then also you can follow the method which I am going to explain you right now for configuring GST in Tally using GST Classifications. From Gateway of Tally, go to Inventory Info. Then, select the last second option which is called Tax Rate Setup and then select GST. 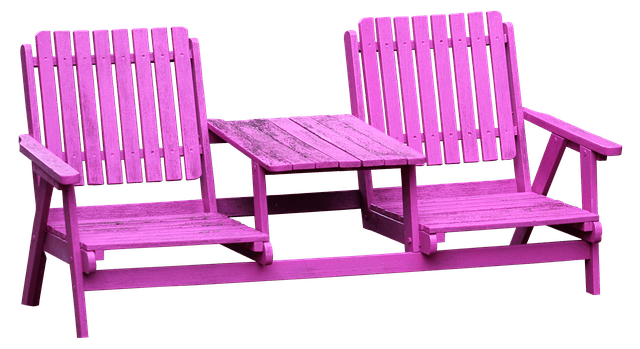 You will see Furniture as we have created that group. When the selection is on Furniture, press ALT+S which is a shortcut here for setting GST Rate. A GST Details Screen will open up. The first option will be of the Classification. In that select 2424 by typing 2424. If you go into the Furniture Group, you will see the GST Rates applied to all the Stock Items which are Chair, Table and Sofa. You do not have to alter each and every stock item to configure it for GST in Tally. This saves a lot of time. This also saves you from making errors if you would have entered it every single time in each stock item because it is repetitive process. Now, I will show you how you can use GST Classification if you are providing services by altering ledgers. If you are providing a service or different kinds of services, this method will save you a lot of time for configuring Tally for GST. 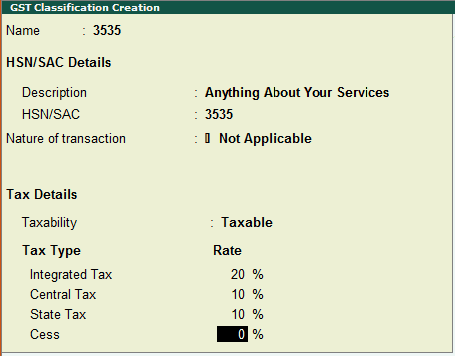 We have already created a GST Classification for SAC which is 3535. The entry for providing a service is generally a Sales Voucher in Tally but it is an Accounting Invoice instead of Item Invoice because we are selling services and not items or products. You can press ALT+I while in Sales Voucher to flip from Item Invoice to Accounting Invoice and also to do the exact opposite. So, coming back to the GST Classification, here is how you can do it. For the explanation, let’s take a Ledger called Accounting Services which is created under Sales Accounts. I have already created it and if you want to know how to create a ledger, go through this post thoroughly in which I have explained creating ledgers in Tally in a simple and easy way. Let’s start with altering the Accounting Services ledger to configure it for GST with the help of a GST Classification in Tally. From Gateway of Tally, go to Accounts Info. Under Single Ledger, select Alter. Select Accounting Services from the List of Ledgers. You will see a Ledger Alteration screen which exactly looks the same when you create a ledger. Now, under Statutory Information, type Yes against the option Set/Alter GST Details. You will see GST Details screen for the ledger. Type in 3535 and press Enter. Make sure the Type of Supply for the Accounting Services Ledger is Services since we are providing services. Press CTRL+A to save the ledger. Now, if you will pass an entry, you will see that GST rate is automatically applied to the ledger. 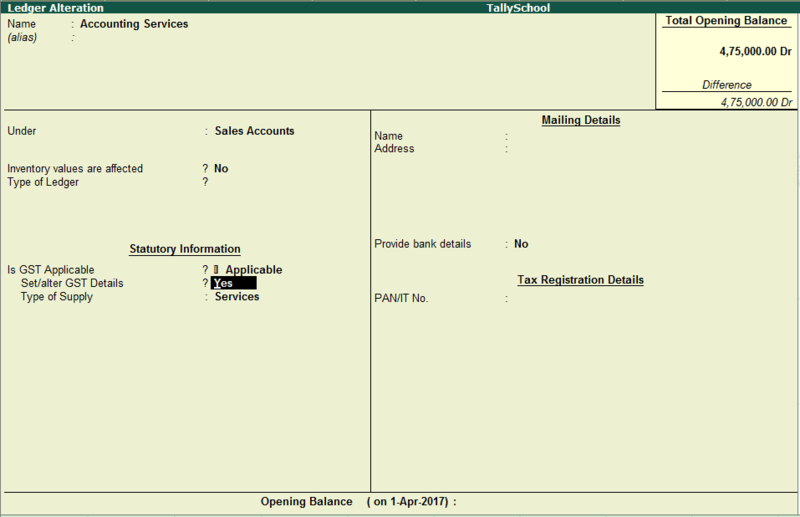 Still, you have to add the GST Taxation ledgers while creating a GST entry in Tally. Till this point, you have understood the meaning of GST Classifications in Tally as well as creating and using GST Classifications in Tally. What happens if a GST rate changes after sometime? Actually this is happening quite a few times right now as GST is still in its initial phase. This can also be taken care of by altering GST Classification in Tally. Let me show you how you can do that. 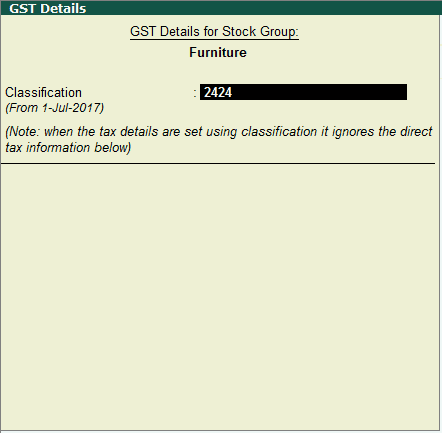 We will change the GST rate of Furniture Stock Group in Tally for this example because we have already configured it via GST Classification. Then go to Statutory Info. and select GST Classifications. Select 2424 i.e. the GST Classification which we used for Furniture Stock Group. Go to the Tax Details and enter the new rate. For this example, I will be entering 24% Integrated Tax which means 12% Central and 12% State Tax. As soon as you save this, you will be asked to enter the date from which the new rate is applicable. Enter a new date. 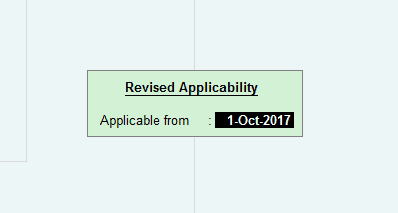 The reason that you enter the date of Revised Applicability is because you have created entries with the old rates which will not be affected when you enter the revised rate from a new date. So, for example, if I have sold a chair from the above stock items with the old rate which was 28%. Now, even if we change the GST Classification as the new rate is 24%, it will not affect the old entries because of entering the date of revised applicability. Watch the video in Hindi in which I have shown everything about GST Classification in Tally. I am sure you have enjoyed this post and the video. You will definitely save a lot of time while passing entries even with multiple GST rates in Tally. Using GST Classification is one of the most time saving options but one of the least used by the people because you have to actually enable it to see it in Tally. I think the people at Tally Solutions (the company behind Tally) should enable it by default so more people can use it. What do you think? If you have any questions or suggestions or just want to say a big thank you 🙂 , comment down below and I’ll happy to reply you back. Closing Stock Entry in Tally – Things You’ll be Surprised to Know! PL.advise me how accounting is to be made for goods purchased on which tax is to be paid under reverse charge. There is a special option in Tally which automatically calculates GST on reverse charge. Enable it when you create a stock item in the GST Details Screen by going into configuration. In gst classification…while setting rates , the rates I tried to change is not getting reflected, when I checked again old rates were showing not that rate which I true dchanging .. Try entering the rates and please make sure that the revised applicability date is set after the date of the previous rate change. Then, make sure you have saved everything correctly by pressing CTRL+A.